Naltrindole is a highly potent, highly selective delta opioid receptor antagonist used in biomedical research. In May 2012 a paper was published in Nature with the structure of naltrindole in complex with the mouse δ-opioid G-protein coupled receptor, solved by X-ray crystallography. Since peptide compounds are unable to cross the blood–brain barrier, researchers developed naltrindole to be a non-peptide antagonist analog of the delta-preferring endogenous opiate enkephalin. 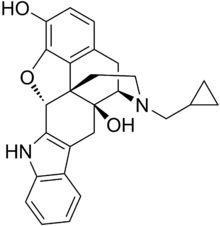 Enkephalin contains an aromatic phenyl group on its Phe4 residue, which was hypothesized to be the "address" sequence responsible for the opiate's delta opioid receptor affinity. Thus, attachment of a phenyl-containing indole molecule to the C-ring of naltrexone's morphinan base successfully produced a drug with the high receptor affinity of naltrexone, but which binds almost exclusively to the delta opioid receptor. ↑ Granier, S.; Manglik, A.; Kruse, A. C.; Kobilka, T. S.; Thian, F. S.; Weis, W. I.; Kobilka, B. K. (2012). "Structure of the δ-opioid receptor bound to naltrindole". Nature. 485 (7398): 400–404. doi:10.1038/nature11111. PMC 3523198 . PMID 22596164. ↑ Lipkowski, AW; Tam, SW; Portoghese, PS (Jul 1986). "Peptides as receptor selectivity modulators of opiate pharmacophores". Journal of Medicinal Chemistry. 29 (7): 1222–5. doi:10.1021/jm00157a018. PMID 2879914. ↑ Portoghese, PS; Sultana, M; Takemori, AE (Jan 1988). "Naltrindole, a highly selective and potent non-peptide delta opioid receptor antagonist". European Journal of Pharmacology. 146 (1): 185–6. doi:10.1016/0014-2999(88)90502-X. PMID 2832195.